Just a heads up: I do not have much time to work on this plugin anymore. Features and bugfixes will come very slowly, if at all. The source code is open and available at the bottom of this page if you would like to fork it and submit a pull request. Thanks for your understanding. This plugin allows players to store books, maps, and more into those once useless bookshelves - just like chests! It encourages players to write books and store them in shelves, and can build onto your economy with libraries and bookstores by using the built in Vault support. Unlimited bookshelves make rule walls a thing of the past; store rule books inside an unlimited shelf, and every player can have one! 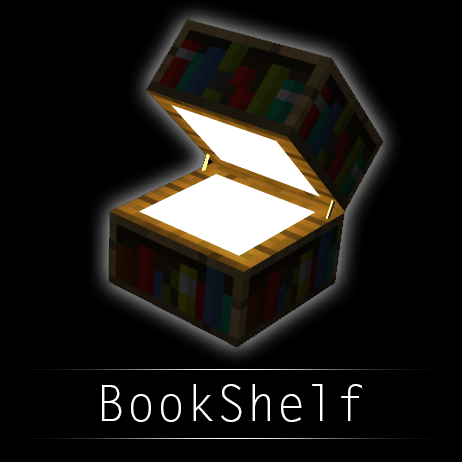 Book Shelves are opened like a chest, by right clicking on the shelf. This opens a chest-like inventory that only allows the storage of books, maps, records, and paper. The items are stored in an SQLite database, so no setup is required to use this plugin! MySQL support is optional. These are just a few of the many features of BookShelf. Store books, maps, records (music discs), and paper in bookshelves! Right click on shelves to open a familiar chest-like inventory! Configurable top/bottom access. Disable it, and hide the shelves in your floor! Create unlimited shelves that give out infinite copies! - Great for rule books, libraries, newspapers, city maps, and more! Combine unlimited and shop shelves to create a shop that has unlimited copies! - Great for server stores! Create a donation shelf type that allows the owner to add/remove books, while other players can only add books! Good for library submissions! You can only store books, maps, paper, and records. Items maintain their position in the shelf; none of that "auto-sorting" business. Runs on SQLite - No setup! Can be configured to use MySQL instead of SQLite!! Each shelf can be individually named - Great for naming library sections! Configure what types of books can be put into shelves! When the shelf is broken, books drop like a chest - nothing is lost! Reloading does not break the plugin!! Signs can be placed on shelves! Enable/disable certain shelves, all shelves with the same name, or Enable/Disable all shelves by default! Multiple players can access the same shelf at the same time! Disable selling books/paper to villagers! Shelves have ownership!! Ops are owners of every shelf. Check out other videos by bizburns01 (Luigi_Vampa)! Click here to learn about the Config, Permissions, Commands, Economy, and read the FAQ! Thanks to Deathmarine for his awesomeness and code samples he let me learn off of! Thanks to all the awesome people who made videos about BookShelf! Thanks to lvk and softvelvet for the donations! Excuse me, what file encoding of your java sources? It's not like utf-8. It's like one-byte encoding. But what code page? I think I found one mistake in your code, when plugin AsyncWorldEdit is used. Your purge engine throw exception because of concurrent access to shelvesToPurge (ArrayList ). While you deleting shelfs from db in ShelfScheduler class, Another thread continue adding new locations to shelvesToPurge. So, I'm trying to debug it but I can't recompile your code. I don't know eclipse and maven. I'm trying to use IDEA but it warns on some files and compiles wrong modules (string constants). It tries open files as utf-8 and warns. It asks me to specify encoding of source file. Is it important what code page to use, or just to specify any one-byte encoding? Hello. I have a couple of questions. Are you able to set it up where only certain ranks can create these bookshelves? Also, when it says "disable selling books/paper to villagers", is that function toggle-able? It would be a very nice feature! Have you publish your sources somewhere? I haven't touched this plugin in a long time. Maybe I can look at it and see if I can fix that for you :) That's a really cool interface you made!! Also, it looks like someone else updated my source code to work with Spigot. I was never informed about it, but that's alright. Is it possible to save the state of a book with BookShelf, if it's a copy or an original? When we drop a copy of a book into a bookshelf, when we go back to take it, it became an original. Another question, are you the author of this resource on Spigot? Hey. I've noticed an issue with the bookshelf. Place a piece of paper with lore on the shelf, type /bsu and the paper that comes off the shelf has no lore. That an issue you can fix? Thanks. Has anyone else had DataBase problems with BookShelf? My server will not run BookShelf configured for SQLite. While it does run very well using mySQL, I have to restart my server when the DB connection is automatically closed. I submitted tickets on these problems if anybody would care to take a look. Error with QSLite BookShop on server start. Problem with Bookshelf and mySQL on my server. As an administrator of a server that hosts multiple Minecraft games, I'd like to suggest that when BookShelf initializes it's tables in the mySQL server, rather than using such generic names that could be stepped on by other plugins using the same database, that BookShelf prepend the table names to make them non-generic. Examples: bs_donate, bs_enable, bs_items, etc. Some plugins even give a setting like prefix: "bs_" in their batabase setup in their config.yml. This allows the game admin to set the desired prefix. For those who have there games on a hosting service, it might be hard or impossible for them to get multiple databases assigned to them. What BookShelf commands can be run from the console? Is it possible to use commands from the console on a shelf using it's title? I need to be able to set a bookshelf to donate once the player removes a book to keep him from removing another copy until he returns the copy he has to the shelf. After studying BookShelf's use of the mySQL database, I now realize that I can do all this through the database. I am getting this error also. However, that's not the whole error homey. It seems to be caused by Enchanted Books in specifically. Duplication bug : if two players open the same bookshelf, both can take one item and duplicate. Is there a way to set it so a player gets paid when their books are bought from a shelf? Sort of like ChestShop, so when their books are bought they get money. Hey. One thing I've just noticed about the plugin. When I put a book on the shelf that has custom data on it the data is gone when I take the book off again.